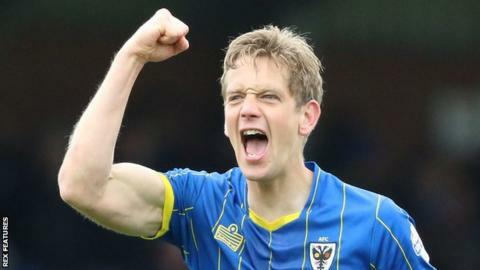 Paul Robinson headed a late winner as AFC Wimbledon maintained their League Two play-off push with victory against Crawley Town. Crawley almost took the lead early on when Sonny Bradley headed Lyle Della-Verde's corner onto the top of the bar. Adebayo Akinfenwa went close for the hosts, but headed off target after beating keeper Jack Rose to the ball. Robinson sealed victory for the Dons when he rose to head home a Barry Fuller cross eight minutes from time. Victory leaves Wimbledon seventh in the League Two table, two points ahead of eighth-placed Wycombe and with a game in hand. Crawley slip a place to 18th following the defeat. "The game was everything I thought it would be. Our pitch isn't conducive to lower-league football let alone any league football. "It was a scrap and they came to do a job on us. They'd just been beaten 5-0 last week, and we knew that we would have to just keep going. "If we'd have come away with a point, I still would have said it was a point towards our total." "It's disappointing the way we conceded, the game plan was good and I've just said to the boys in there, I want to tell them well done but we've just been beaten again. "It's there those fine margins where we switched off and it was good play by them. The one time we switched off, it sums us up. "I am really gutted for the boys. You know it's four games to go till the end of the season and we will see where we are. "I'm not digging them out, but our concentration levels have got to improve whether the players are here next year or not." Match ends, AFC Wimbledon 1, Crawley Town 0. Second Half ends, AFC Wimbledon 1, Crawley Town 0. Corner, Crawley Town. Conceded by Callum Kennedy. Substitution, Crawley Town. Roarie Deacon replaces Jimmy Smith. Corner, AFC Wimbledon. Conceded by Charles Dunne. Charles Dunne (Crawley Town) is shown the yellow card for a bad foul. Sonny Bradley (Crawley Town) wins a free kick in the defensive half. Substitution, Crawley Town. Lewis Young replaces Lyle Della Verde. Goal! AFC Wimbledon 1, Crawley Town 0. Paul Robinson (AFC Wimbledon) header from the centre of the box to the centre of the goal. Assisted by Barry Fuller with a cross. Lyle Della Verde (Crawley Town) is shown the yellow card for a bad foul. Foul by Lyle Della Verde (Crawley Town). Substitution, Crawley Town. Shamir Fenelon replaces Lee Barnard. Charles Dunne (Crawley Town) wins a free kick on the right wing. Darius Charles (AFC Wimbledon) wins a free kick in the attacking half. Substitution, AFC Wimbledon. Sean Rigg replaces Connor Smith. Corner, Crawley Town. Conceded by Barry Fuller. Attempt missed. Joe McNerney (Crawley Town) header from the centre of the box is too high. Lanre Oyebanjo (Crawley Town) wins a free kick in the defensive half. Attempt missed. Lyle Taylor (AFC Wimbledon) right footed shot from the left side of the six yard box is close, but misses to the left. Substitution, AFC Wimbledon. Callum Kennedy replaces Jonathan Meades because of an injury.